Anchorlight is a creative space, founded with the intent of fostering artists at varying stages of their development. Anchorlight provides a combination of artist studios, residency opportunities, and exhibition space. Through the establishment of an internal community of artists, designers, and craftspeople, Anchorlight encourages mentorship and the cross-pollination of knowledge and skills. In this way we strive to enhance the cultural environment of the surrounding community and our city as a whole. Anchorlight offers semi-private individual studios for artists and designers. Our building has high open ceilings and skylights. Studios are equipped with either LED strip lights or fluorescent shop lights with natural daylight bulbs. There are shared common sinks and flexible gallery space for exhibitions or pop-up events. Anchorlight studios range from 145-500 square feet. **All of our studios are currently occupied. The Brightwork Fellowship is a residency program located within Anchorlight that focuses on service, leadership, and professional development in the visual arts. The Fellowship provides opportunities to artists through exhibition, group critique, community engagement, and service learning experiences. Brightwork Fellows receive an individual studio as well as shared community work space in which to make their work uninterrupted for a period of one year. This combination of private and shared space fosters an environment of community support, the sharing of knowledge, discourse, and skill. The application period for the Brightwork Fellowship Program is open March 15-May 15 2019 for the Summer 19 residency (June 2019-May 2020) and the Fall 19 residency (September 2019-August 2020). Annie Blazejack works with oil paint, textile installation, performance, and video work, following ideas from one material to the next. She graduated from Brown University, and received her MFA from The School of the Museum of Fine Arts, Boston / Tufts University in 2013. While pursuing her graduate degree, Blazejack began a long-term collaboration with Brooklyn-based painter Geddes Levenson. Their artworks weave a feminist, environmentalist sci-fi narrative. Embroidery artist Jennifer Markowitz uses thread to inspect feelings of dislocation. Her ongoing series titled Fleshmap: My Embroidered, Bipolar Geographies, maps the geography of her own bipolar disorder since 1985. Her hand embroidered panels encompass images and text pulled from memories, traumas, confusions, and artifacts. This body of work invites the viewer to travel through an unflinching navigation between memory and pace. Julia Caston creates interactive experiences for people based on concepts of belonging, privilege, humor, compassion, and interpersonal communication. Her practice encompasses drawing, sculpture, and performance art. Raleigh native André Leon Gray is a self-trained artist who works in a variety of media to examine the impact of history on present day power structures and social hierarchies. He transforms mundane objects and materials into powerful social commentaries to encourage conversations among his diverse audience. 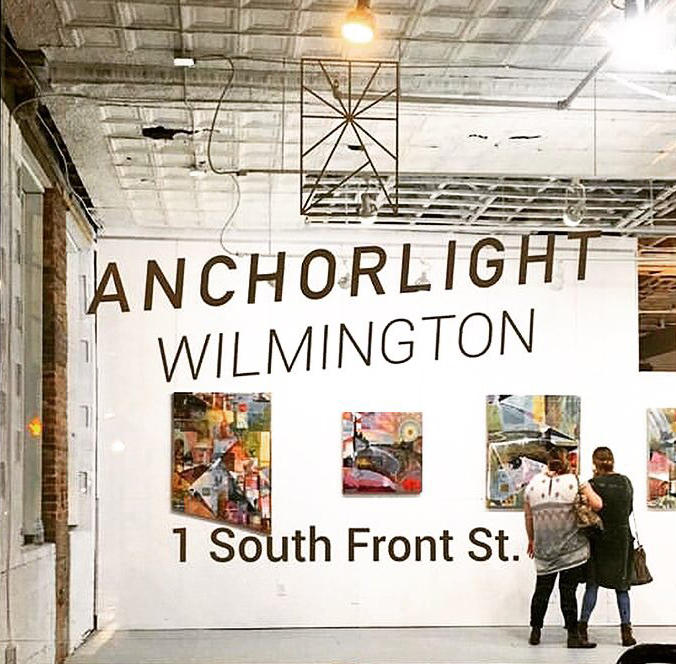 Anchorlight Wilmington is a short-term artistic activation of space in downtown Wilmington that seeks to contribute to the vibrant arts community through exhibitions, residency opportunities and community programming. Located at 1 S. Front St., the project is an extension of the creative space in Raleigh, N.C. called Anchorlight that is home to artist studios, exhibitions and production space. Developer James Goodnight has partnered with regional artists to provide unique opportunities that engage the community on universal themes through the making and exhibition of art. A Practice of Noticing: Photographs From The Weekly Hunt by Anchorlight Studio Artist Elisabeth Effron. The Weekly Hunt is a community driven art project that teaches mindfulness practices through photography and social media. The goals of The Weekly Hunt are to use cell phone photography to practice moving slower through our days, to observe the world around us more closely, and to experience empathy when discovering experiences that are new and different than our own. Visit @TheWeeklyHunt on Instagram or The Weekly Hunt website for more details. The work displayed in the Anchorlight Wilmington gallery represents images taken during the first four weeks of The Weekly Hunt printed on silk. Each visitor to the gallery is asked to contribute their own images to the project through social media and explore what mindfulness can add to their day to day experiences. For the run of this exhibition a Weekly Hunt specific to Wilmington has been created. Images submitted to The Wilmington Hunt will be displayed digitally at the closing reception. Hours: By appointment only with the exception of special events. See the “Happenings” page of this website to view upcoming special events. Contact us using the form below to make an appointment. Accessibility: The accessible entrance to our gallery is one door down from the main gallery entrance. Accessible parking is available. The accessible entrance to the classroom in 1401 S. Bloodworth St. is on Hoke St. If you are planning a visit and have questions about accessibility please contact us using the form below.